Boring pitching workouts create bored pitchers, and bored pitchers are very hittable. To improve your pitcher’s movement and control try this extreme target pitching practice. Too often pitchers avoid practicing their weaker pitches and locations which leads to weak pitches and poor control in games. Discover 4 very extreme targets that can really improve the Curveball and Screwball. Everybody likes to be good, pitchers included. That’s why they usually avoid practicing their weaker pitches, very seldom throw their strong pitches to weaker locations and usually stick with what they do best. While this might sound like solid reasoning the flaw is that pitchers more often lose because of their weaknesses than they win as a result of their strengths. Knowing that, we need to help our pitchers work on these weaker pitches or locations while also keeping their attention razor sharp. All too often I see pitchers practicing with either a target right down the middle, or else a very common target for a specific pitch. Neither one challenge the pitcher, help her improve her control and mastery of the pitch or require her to focus and concentrate. And yet all of these are required of her in a game. So, to really make practice help the pitcher prepare and improve for a game, pitchers need to really challenge themselves in practice – something that most pitchers, and coaches usually avoid. 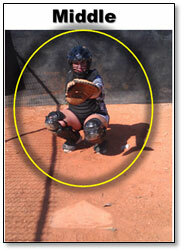 So, I stumbled onto this rather extreme pitching workout one day while working with a pitcher on her curveball. She was being really careful (as most pitchers are) and didn’t want to do anything to make a mistake. Since this is probably THE WORST way to practice, as mistakes are learning opportunities and only happen when you are growing your skill, I came up with this extreme pitching practice to force her out of her comfort zone. I started doing this with just her Curveball but then quickly realized the same concept works with the Screwball as well. Basically, the idea is to create 4 very challenging targets ranging from Hard to Normal to Tough to Extreme. The picture to the right shows what these 4 targets look like for the Curveball. These comments are all valid, and yet are the signs that the pitcher’s comfort zone has been destroyed, which mean we’re making progress. Nobody likes to change and these extreme targets force the pitcher to change. They also challenge her, improve her and ultimately free her up from her “careful” norm. I’ve been doing this workout with pitchers now for a couple weeks and it’s amazing how quickly they surprise themselves and actually start hitting these targets with their Curveball. They may struggle with one more than the others but they are so proud of themselves that they can actually hit these crazy targets. This same concept works with the Screwball as well. 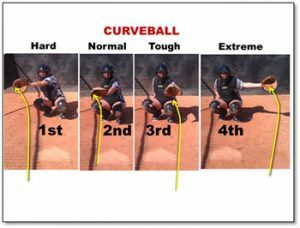 But instead of going from left to right as you do with a Curveball (from a righthanded pitcher) you go from right to left since you want to start in the area of “normal” pitch movement and work your way towards the extreme. 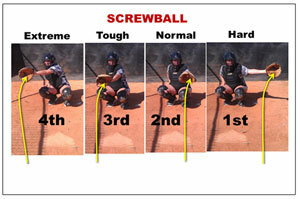 The picture below shows what this looks like with the Screwball. You can also do this with the Rise and the Drop – you’d just go Up and Down instead of Side to Side. The adjustments I’ve made with the Rise and Drop is to only use 3 targets instead of 4, but that’s it. Remember to start in the direction of pitch strength and work toward the extreme. For a Drop, you’d start extra low (Hard), then Normal Drop height, then about Head height for Extreme. For the Rise you’d work in reverse order: Above Head for Hard, head height for Normal and then knee height for Extreme. These are much more difficult for pitchers than the Curve and Screw targets so have patience and don’t overdo it. Start from the normal direction the pitch moves and work your way backward to Extreme. Let them know they can create more movement the farther away the target is from homeplate (to prevent the ball breaking into the plate). Start with larger quantities of pitches per location and then work down to only 1 pitcher per location. Eventually go from left to right with the Curveball and then back right to left with the Screwball. Realize that your pitcher can actually throw both a Curveball and a Screwball to the opposite side of the plate. Don’t be afraid to come up with your own Extreme Pitching Workout. Challenge the “normal” and watch your skills and focus really grow!